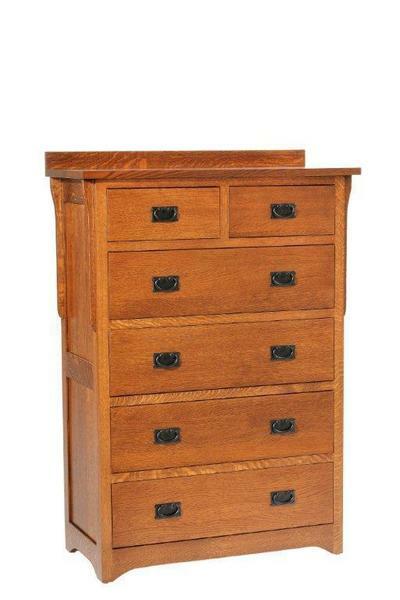 A brilliant way to add that extra storage into your bedroom decor, our Amish San Juan Mission Chest of Drawers features six full-extension drawers, to hold all of your clothes and linens in a neat and tidy way. Add the optional soft-close glides and you will never have to worry about slamming or leaving your drawers open again! Each piece in our San Juan Mission collection embodies the beautiful Mission style that has remained popular for centuries. With the clean lines and large, flat panels, you can incorporate this timeless look into any room in your home! The San Juan Chest of Drawers is bench-built from solid, North American hardwood and finished to perfection - creating an heirloom quality piece that can be handed down for generations. Call one of our experienced Amish Furniture Specialists today to answer your questions and start your order by phone - Toll-Free (866) 272-6773.